Frustrated by University expectations and processes, the Greek organization will appeal to retain housing. The decision follows four years of the frat’s failed conduct reviews. The Theta Delta Chi (TDX) fraternity will lose its housing at the end of this school year, after the University found for the fourth year in a row that the group “needs improvements” to meet Stanford’s “Standards of Excellence” (SOE) governing reviews of Greek organizations. The fraternity plans to appeal the decision, and will receive a final outcome from Residential Education (ResEd) by Feb. 1. “Long-standing concerns” about alcohol consumption, including “several” investigations within the past year, were among the University’s main concerns about TDX, according to the chapter’s SOE review released this fall. Members of TDX found the process of meeting the University’s requirements difficult and frustrating, according to the new TDX president Nico Garcia ’20, who assumed his position last week. Newly elected vice-president Michael Quezada ’20 echoed Garcia’s sentiments. “It seems like to me — from what I’m aware of — each year they came up with something different,” Quezada said. The fraternity has circulated a University-wide petition to galvanize support in its quest to retain its housing. TDX leadership told The Daily they were shocked to find out that they would lose their housing after what they deemed to be insufficient warning. “It definitely felt out of the blue to us,” Quezada said. Residential Education (ResEd) told TDX last March that it could lose its residence at 675 Lomita if it did not raise its scores under the SOE system, according to a March 25 letter from ResEd Assistant Dean Amanda Rodriguez to TDX leadership. TDX received the lowest score, a “3” — indicating the “needs improvements” designation— following this year’s review, and was put on probation for winter 2019. Organizations must score a “2” in order to “meet expectations” and a “1” indicates that a group has exceeded the University’s standards. Chapters that do not meet or exceed expectations are placed on probation, and have one quarter to improve their status or face removal from the chapter facility. According to the program description, SOE reviews are based upon the Greek organization’s promotion of shared values, development of group identity and mission and adherence to community norms, among other considerations. TDX plans to appeal the decision directly to ResEd Dean Koren Bakkegard, Garcia and Quezada confirmed to The Daily. The group has until Jan. 28 to file the appeal. Appeals can cite bias or procedural errors in the evaluation process or offer new information worth the University’s consideration, Rodriguez’s letter states. Bakkegard’s response to the appeal, to be issued by Feb. 1, will be final. TDX’s petition is modeled after Outdoor House’s Nov. 2018 efforts to defend its housing. The SOE program was established in the 2014-15 school year, with the goal of assessing Greek organizations on campus and helping them to “enhance their positive impact” on the broader community. The program launched shortly after fraternity Sigma Alpha Epsilon (SAE) lost its housing, amid heightened national scrutiny of Greek organizations’ conduct. 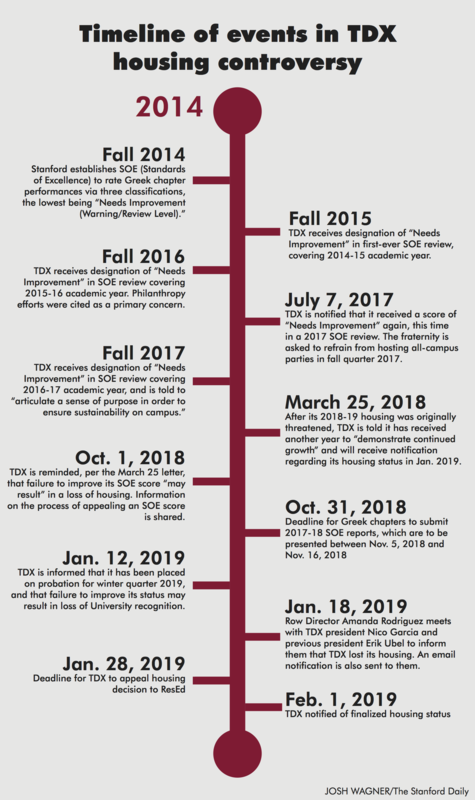 The University’s first-ever SOE review in 2015 gave TDX a low score, taking issue with the chapter’s communication with ResEd as well as chapter management and finances. The University reiterated that sentiment last spring, telling TDX to develop its “mission, vision and group identity” shortly after warning that the organization could lose its housing in the next SOE review if it did not raise its scores. Stanford also instructed TDX to “abide by the University policy and California law that prohibits smoking inside the facility at all times,” among other directions. That same month, Stanford’s Organizational Conduct Board (OCB) opened an investigation into TDX regarding “alcohol-related incidents” at three recent TDX social events, according to the chapter’s November submission to the University for its latest SOE evaluation. Two months later, the investigation expanded to examine another event the chapter held in April. TDX argued in its November report on SOE progress that the chapter has worked hard to address University concerns. “This process has been uncomfortable and frustrating for the members of our organization, and canceling our social events has certainly affected the morale of our community—but we felt (and still feel) that the latter action constituted a necessary step… to ensure that our organization is doing its best to keep our fellow students safe,” TDX members stated. The group said that it had stopped serving hard liquor at events. In the future, TDX wrote, it would take further actions to improve party safety, including checking IDs and monitoring drinks “more stringently”; putting kitchen tables away during events to prevent people from dancing on top of them; bringing in Stanford Office of Alcohol Policy and Education staff for workshops; drafting a risk management plan; and requiring members to complete sober monitoring and party-planning training. After the 2018 SOE review, TDX was placed on probation for winter of 2019 and asked to create an action plan. The chapter was told that if it could lose University recognition or housing privileges if it did not improve during the probationary period. In addition to the shock of finding out that TDX has lost its housing, Garcia highlighted the discrepancies between the University’s claims of support toward Greek life and what he views as its unfair punishments for Greek organizations. Discussing a recent meeting among university officials and representatives from all campus Greek organizations, Garcia said that the university encouraged fraternities to “be excellent” and “step up and be the role models” for the campus community. However, one week after the meeting, TDX received news of the ResEd decision. “I understand this is not the news you hoped for, however we are committed to supporting you as an unhoused organization moving forward,” Rodriquez wrote in the Jan. 18 letter informing TDX of its housing loss. TDX members argued that the University wants Greek organizations to stand as “pillars” of communal excellence, yet also imposes harsh sanctions on them. “If they want us to meet expectations and to continue to improve, I think it’s instrumental that we keep this house and keep this space for the community, so that this community has a place to center around and work on the things that [the University administration] wants us to,” Garcia said. Other TDX residents reiterated Garcia’s sentiments, saying the chapter fosters a strong sense of belonging for its members. TDX member Luke Soon-Shiong ’18 told The Daily last spring that he felt comfortable exploring gender in TDX as someone who identifies as genderqueer. He also noted a growing Native American community within the fraternity chapter that he believes has encouraged more Native students to rush the group. 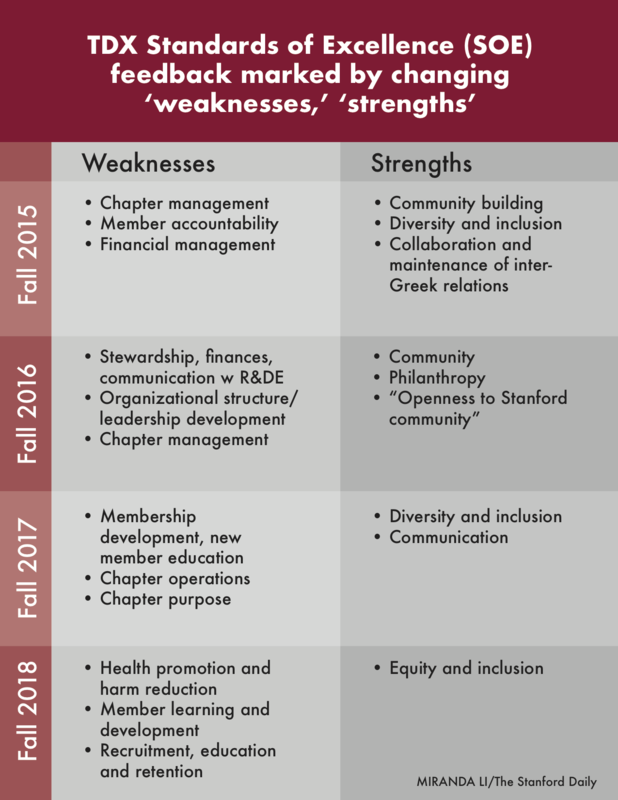 ResEd commended TDX last fall for its “equity and inclusion”— a consistent strength in SOE review reports that TDX members have emphasized amid long-standing concerns about and efforts to increase diversity in Greek life broadly. However, Garcia speculated that rather than work alongside Greek organizations to build upon these improvements, the University is actually attempting to “cut down” on Greek organizations as part of a broader initiative to limit students’ housing options. Other members of Greek life feel similarly, says a fall Op-Ed by Kappa Sigma senior and Daily columnist Harrison Hohman ’19. “In bureaucratically taking us down, or in kind of setting different expectations … it seems like they’re executing, with purpose, this sort of take-down to root us out,” Garcia stated. Multiple other fraternity presidents said the same in previous interviews with The Daily. However, Student Affairs spokesperson Pat Harris categorically denied that the University’s ResX Task Force is trying to shut down Greek life on campus by stripping fraternities of their housing. According to Harris, Stanford’s ResX Task Force has not reached any definite conclusions about how Greek life will factor into its proposed plans to establish residential “neighborhoods,” which are housing clusters similar to Harvard’s “houses” or Yale’s “residential colleges.” The Task Force convened last spring and is charged with developing recommendations for improving residential life under the University’s long-range planning process. During the last five years, both the Sigma Chi and Sigma Alpha Epsilon fraternities have lost their Stanford housing. Most recently, Sigma Chi lost its campus residence in May 2018 after an investigation by Sigma Chi International during which the fraternity was barred from participating in spring recruitment, leaving them without a 2018 pledge class. The investigation followed an alleged January drugging by a non-Stanford affiliate at the Sigma Chi house. Three years earlier in May 2015, the Sigma Alpha Epsilon fraternity also lost its housing following two Title IX investigations conducted by the University. The initial Title IX investigation opened in July 2014 over concerns that SAE “caused, condoned and tolerated” a “sexually hostile environment” at its May 2014 Roman Bath party. The investigation results came out in December and led Stanford to place the fraternity on alcohol suspension, social probation and a two-year housing suspension beginning spring 2015. The second investigation opened in March 2015 after concerns that SAE violated probation and participated in acts of retaliation or harassment that month. The investigation then expanded to look into alleged retaliatory behavior against a Title IX witness in Cabo San Lucas over 2015 spring break. In May 2015, as a result of the investigation, the fraternity lost its housing indefinitely, and the University placed SAE on probationary status for three years. Other currently housed fraternities include Phi Kappa Psi, Kappa Alpha, Kappa Sigma, Sigma Nu and Sigma Phi Epsilon. Holden Foreman, Erin Woo and Claire Wang contributed to this report. Contact Hannah Knowles at hknowles ‘at’ stanford.edu, Ellie Bowen at ebowen ‘at’ stanford.edu and Berber Jin at fjin16 ‘at’ stanford.edu.